Still-life of New Year's kagami mochi topped by tangerine in upper right corner on cloth backdrop. Cylinder-like object stands to the left of the mochi. Below cylindrical object are 2 pieces of fruit, 1 pomegranate on left and 1 orange on the right. 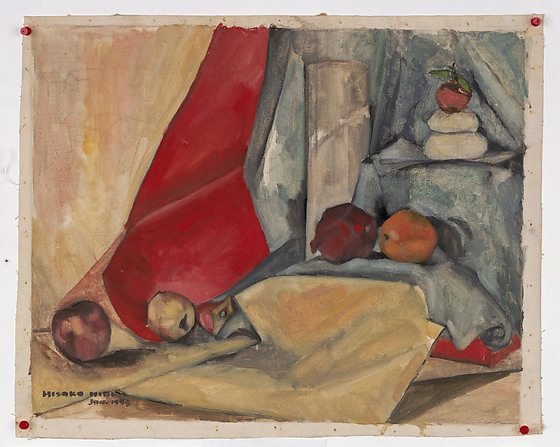 Red cloth draped near center with 2 apple as at bottom. Upper left corner is a quick pencil sketch of buildings and people Signed in lower left corner: Hisako Hibi Jan. 1943. On back: Hisako Hibi. Jan 1943 at Topaz. Japanese without mochi (pounded sweet rice) is no New Year! It was very sad oshogatsu (New Year). So, I painted okazari mochi in the internment camp.